When teeth come together in their habitual accommodated position the muscles of the face and lower jaw may not function comfortably in this position. A more physiologic relationship must be established to support comfortable musculature and posture. 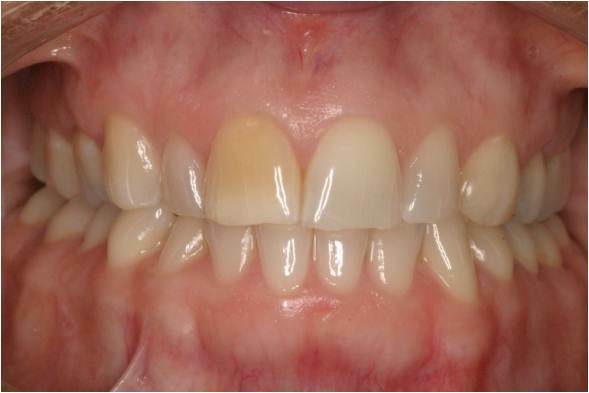 This patient presented with neck aches, headaches and previous unsuccessful orthodontics treatment. She wanted her lost quality of life back. After a number of years of treatment therapy – Orthotic therapy to stabilize her mandible, expansion orthodontics was implemented while maintaining the precision of her bite relationship to prevent relapse back into TMD pain. Meticulous attention to occlusion is important to rebuild back the missing structures that support ones overall body postural support. Once the bite is orthopedically verticalized and developed using a specialized GNM removable orthotic the bite is tested and proven comfortable. Occlusal wax ups are done to recreate the missing incline plane contacts that are crucial to bring stability to this compromised occlusion. Each tooth is recognized as a supporting mechanism to maintain muscle and joint function as well as overall head and neck stability. It is so more than just making red contact marks meet in a centric position. Finding an optimized physiologic maxillary to mandibular jaw relationship is the key (Low frequency TENS and Myotronics K7 jaw tracking is used to objective measure, locate and confirm the bite position). A bonded fixed orthotic is waxed and fabricated accurately transferred into the mouth over the unprepared natural dentition and proven to be stable. These are the immediate marks before refinement is completed. This transfer bite technique is accurate and reproducible. Before any restorative dentistry was performed, orthodontic arch expansion treatment and a thorough planning and stabilization of the overall postural system was key to successful dental cosmetics and a happy patient. The lower arch was developed, expanded and rounded to improve tongue posture. An Optimized Bite was confirmed using K7 jaw tracking and low frequency TENS (Myotronics, Kent, WA) and neuromuscular occlusal stability was confirmed and measured prior to restorative dentistry. Upper arch orthodontics and orthopedics is also accomplished to develop proper spacing and positioning of the teeth. Since the vertical dimensions of occlusion were increased from the existing pathologic bite position, the lower posterior teeth were verticalized upward into the new predetermined and proven occlusal position. Once the verticalization process was orthopedically accomplished (non surgically), the treatment planning and detailed bite management and occlusal transfer process can now be completed. Restorations are delivered and bonded into place. Minimal occlusal adjustments were required with our bite management protocol which is consistent, accurate and predictable. Patient is very pleased and happy. Trust, confidence and attention to details is what it takes to bring a chronic pain case successful. A lot of time and effort as well as patience is required on the part of the patient to allow tight muscles to unravel. Trusting the treating clinician is also highly valued when an appreciation and dedication to an occlusal philosophy is being implemented step at a time, visit after visit. It takes discipline and dedication. This is GNM Dentistry! A blended approach of both gnathic and neuromuscular. (Recognize that NM is not GNM). There is a difference! Thanks to the all the great lab technicians who contributed to this project in helping this patient regain her quality of life back.